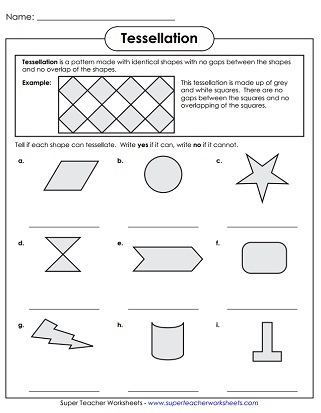 Identify and create geometric tessellation patterns (also known as tiling) with these printable worksheets and activities. Draw tessellations on graph paper for one of the pentominoes shown. Includes examples. 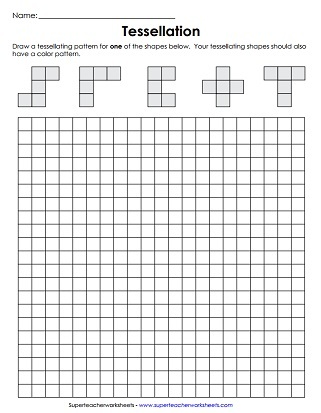 Copy this worksheet on card stock, cut out the images, and use them as patterns for tessellations. Tell which figures can be tessellated and which ones cannot. Create a tessellation pattern on construction by cutting a shape from a three-by-three square of paper and using it as a traceable pattern. This page contains four fun and interesting ways to teach your geometry lesson on tessellation. Tell whether each shale can tessellate. 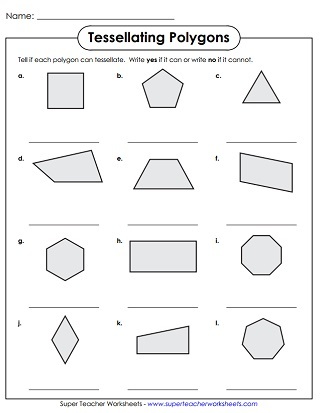 Write yes or no for each shape shown. Tell whether each shape can be tessellated. Write yes or no on the line. Determine whether each polygon can be tessellated. Write yes or no on each line. We have worksheets for teaching students about perimeter, area,angles, polygons, solid shapes, radius, diameter, ordered pairs,coordinate grids, and symmetry. Learn about reflections, translations, and rotations of two-dimensional shapes.